Floating Handle Grip + Floating Block - View the underwater scenery leisurely and never worry about your GoPro camera lost with light yellow and red color. Or fix your GoPro on surfboard and enjoy your surfing, record every amazing surge you experienced. The adjustable blue band ensures the safety and your wearing comfortability. 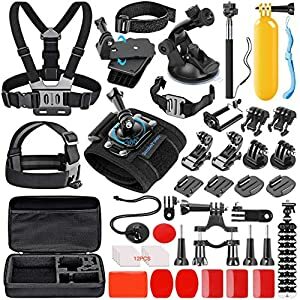 Get it Here - https://www.amazon.com/SmilePowo-Accessory-Session-DBPOWER-Harness/dp/B0751CV4FC? 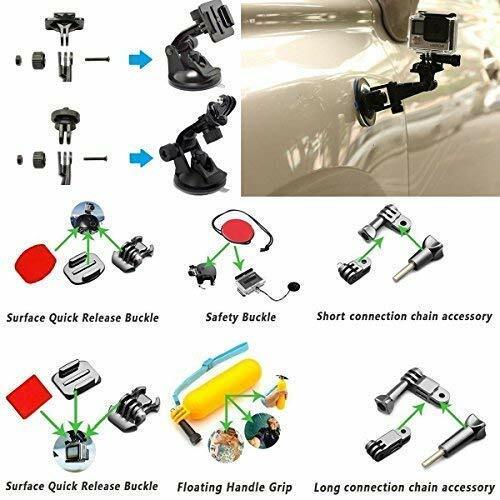 This action camera accessory kit is terrific. 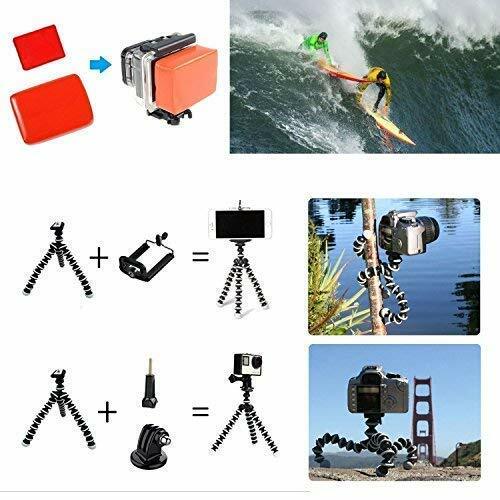 It includes everything that I can imagine to use for an action camera. 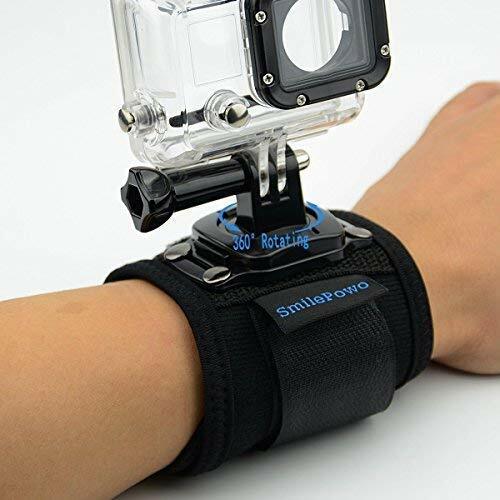 It covers every occasion wherever the action camera could be sued. Within a hard case, these items can be well organized and highly portable. The price is also really good for so many well designed and quality accessories. 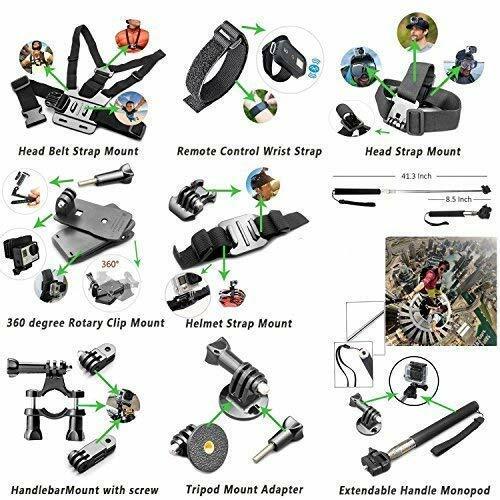 This kit is really worthwhile, I would like to recommend it to any of my friends owning an action camera. I got this kit because as a YouTuber I really needed more ways to use my GoPro Hero 4 silver and my Geekam action camera. This kit now provides me with the means to film in a wide variety of way to get the shots I need. So much here and at such a great price that you just can’t beat it. I am very impressed with all of the mounts, AND with the carrying case that makes it really convenient to take the gear I need with me. A virtual grab-bag of accessories for my GoPro 6. I use primarily underwater for snorkel/scuba. There is an assortment here, but I consider it disposable for ocean diving because it is not corrosion/rust resistant. The selfie stick lasted a few dives before it welded itself closed (even after rinsing well in fresh water right after emerging from the ocean), and I broke the plastic connector trying to open it. Like I said,, I consider it disposable. For above-sea level uses, I’m sure it’d be fantastic, mostly. It is low cost because it is cheaply mass-produced. 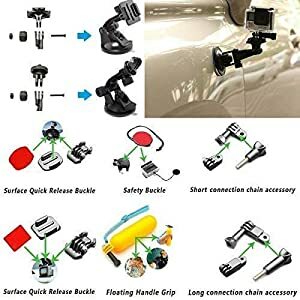 There are very vague “instructions” so, beyond the headstrap, chest strap, and suction cups for attaching to smooth surfaces (outside of cars? yipes), you will probably be guessing on applications. No matter what–screw it down tight, and then some more! I dropped my “tightly” attached brand-new GoPro into the Atlantic on its first dive and only recovered it by dumb luck. Tighten hard–the plastic attachments are pretty tough, and if they are not then I’d rather they break above surface than drop my camera to the bottom, which is often unretrieveably deep… For divers: the headstrap is pretty average, and, like most headstraps, will not stay secure without wearing a hood or a chin strap (latter not included). The spider tripod works great, but the arms are only 4-5″ long. Enough for many but not all applications (like winding around things). 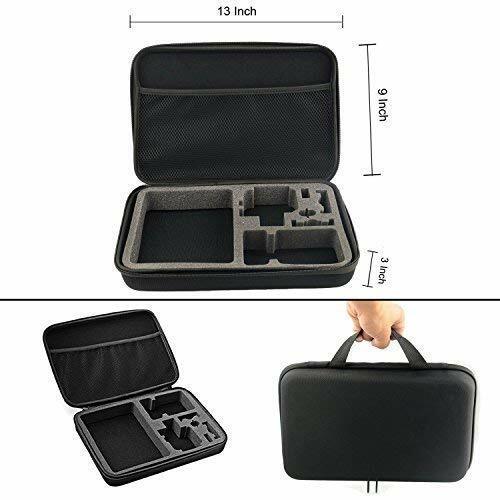 It comes in a protective zippered case that actually was impressive for the price-point, although there is not a specific place for anything–it’s all mish-mash but somehow fits. All-in-all, it is a ton of expectedly cheap plastic appliances that come in a surprisingly decent semi-soft zipper bag that’s probably the most expensive item. I usually shoot in my underwater case that has the screw-in on the bottom. Why these folks included an external case, a decent one, but with the screw-in adapter on the side is beyond me, and so simple to fix. Otherwise, your camera will pretty much be turned 90-degrees (sideways) for every shot unless you “adapt”… Worth the money? Sure. Because enough of the assorted mish-mash, and the decent appearing case (cheap zipper–beware), is useable, probably for most people’s needs. For me, the non-stainless/aluminum junk will/has degrade(d) quickly in saltwater–I expect this and considered it disposable. Have realistic expectations. Also, compare other company’s similar packages. Obviously, they are ALL made in the same factory in China. Same stuff, same origin, same cheap nature, sometimes different prices/profit margins. Dig a little bit in your research to increase the odds that your particular new “kit” contains the maximum items you will ever ever use–all contain items you’ll probably never use. Determine your acceptable cost-benefit line, versus a bunch of useless junk that doesn’t work well, because it might put very expensive equipment at risk of damage/destruction. Also, cheap plastic tidbits will not degrade and disappear for a very long time, perhaps decades/centuries, and the degradation products are already accumulating in animals at alarming rates, and many of those animals comprise our regular diets.